L&L Holding Company, Maefield Development, and Fortress Investment Group have revealed plans for TSX Broadway at 1568 Broadway, designed by our friends at Platt Byard Dovell White Architects (PBDW) and at Mancini Duffy. The first stage of the project involves the demolition of a landmarked theater: the 1,700-seat Palace Theatre, which is to be replaced by with 46-storey tower featuring 550,K SqFt of retail and entertainment space. 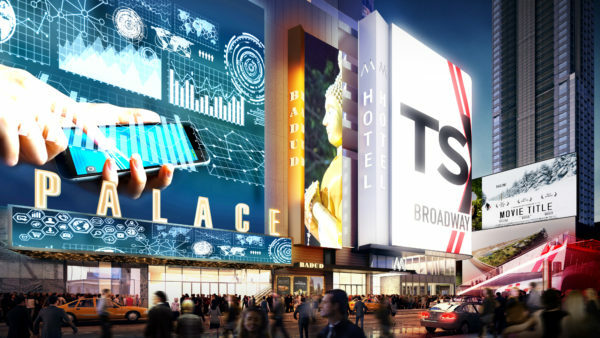 The new theater will be elevated 30′ off the ground; TSX Broadway will also feature a 669-key luxe hotel. The original Beaux Arts theater was built between 1913 and 1912 by Milwaukee-based architects Kirchoff & Rose. Further additions include a new exterior entrance and giant marquee on 47th street. The project, which has a $2.5B price tag, was conceived in the hopes of creating a modern entertainment complex in Times Square and encourage other developers to do the same.